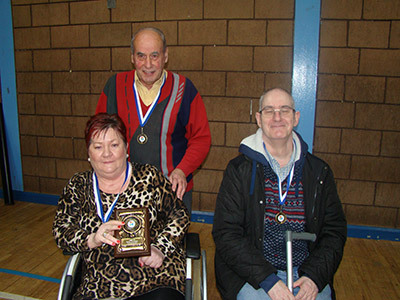 The Andy and Nessie Ross Boccia tournament 2016 took place on 20th October 2016 in the Spectrum Centre. All teams enjoyed their day out. Boccia is a great way of getting people active, while adding a competitive edge when playing games. Jigsaw NI organises and facilitates weekly sessions of Boccia in Andersonstown Leisure Centre on Thursday mornings 10.30-11.30am, Connswater Community and Leisure on Thursday afternoons 1.30pm – 2.30pm and in Skipperstone CC, Bangor on Thursdays 11.30am – 12.30pm and is very popular with our service users. Boccia is a Sport that can be enjoyed by almost anyone regardless of age or ability both in a friendly and/or competitive environment. Jigsaw NI also offers Art, Swimming, Chair-based Activity and Exercise in water. If anyone over 18 with a disability is interested in any of our activities please contact Liz or Clare on 028 90319054. 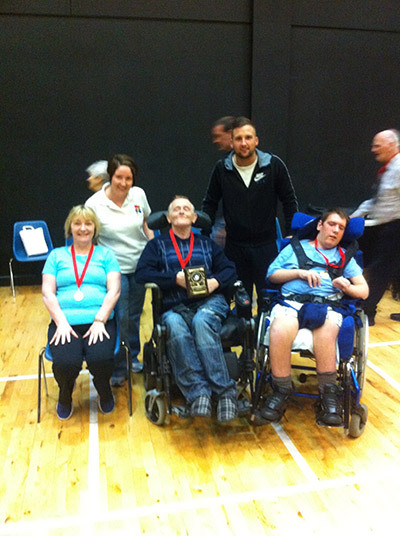 Boccia NI’s Sam Hunter tournament took place on 12th May 2016 at the Spectrum Centre. There were 16 teams from all over Belfast and Newtownabbey areas that took part in the competition, from all different settings including, folds, community organisations, sheltered dwellings, nursing homes etc. Each team played three games and their total points calculated up. The top four teams with the most points got through to the semi-finals. Jigsaw NI had three of the top four places, which is a brilliant achievement and testament to the training they put in each week. The three Jigsaw NI teams that got through to the semi-finals were ‘Beach Boys, Glynis’ Boys and The Three C’s’. The final team to make it into the semi-final was the ‘Ardrigh Lassies’. ‘The Beach Boys’ met ‘The Three C’s’ in one semi-final and ‘Glynis’ boys’ took on the ‘Ardrigh Lassies’ in the other semi-final. After two tightly fought semi-finals, ‘Beach Boys and Glynis’ Boys’ came out on top progressing to the final. ‘Glynis’ Boys’ (pictured above) had come runners up in the last two tournaments, so were very keen to win this time round. The final again was a very tight affair, but Glynis’ Boys edged ahead in the first end and Beach Boys just couldn’t catch up, leaving Glynis’ Boys winning their first tournament of the year. The Andersonstown group meet every Thursday and it is obvious from different tournaments that their practice every week is benefitting the teams in tournaments. Clare McQuiston (Manager of Jigsaw NI) said: “the tournament was great fun for all that attended and all the teams really enjoyed it. 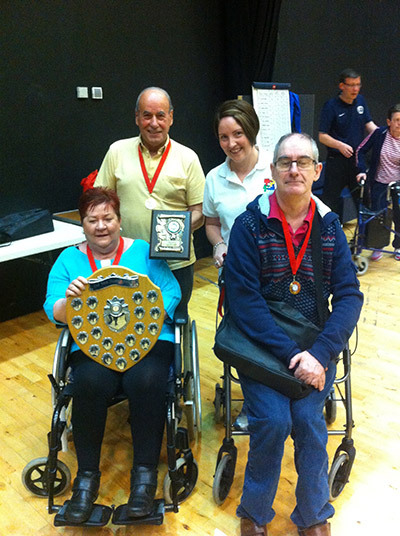 We’d like to thank Boccia NI for organising and inviting us to the event. Well done to all teams that participated and a special congratulation to Glynis’ Boys for winning the tournament. They have been so consistent this year, with two runners up places and now a win out of the three tournaments held. 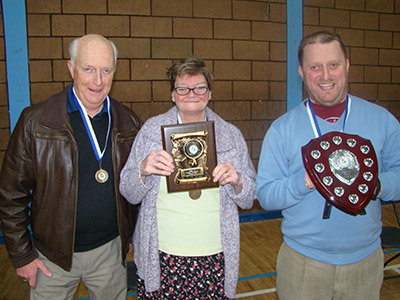 The Jigsaw NI Boccia tournament took place on 10th March 2016 at Connswater Community and Leisure. 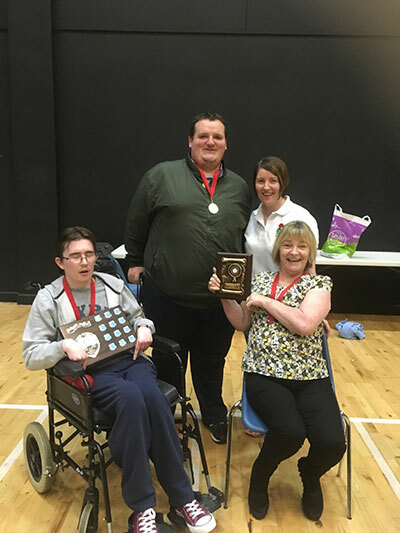 There were ten different teams that took place in the tournament from the three different Jigsaw Boccia groups that are held in Connswater, Andersonstown and Bangor. The teams were split into two different leagues and played on separate courts. Each team played three games within their league. On court 1 ‘Mary’s Mates’ (Andersonstown team), ‘The Seasiders’ (Bangor team) and ‘The Rascals’ (Connswater team) were all on 4 points after the first game, but in the second game The Rascals took the lead collecting seven points. The Rascals maintained the lead in this league with The Seasiders coming in second and this would be the semi-final. A close fought game took place but The Rascals came out on top and proceeded on to the Grand Final. On court 2 ‘Glynis’ Boys (Andersonstown team) and ‘The Beach Boys’ went well out on the lead after their first game racking up 11 points and 10 points respectively. By game three ‘The Beach Boys’ took the lead by three points with ‘Glynis’ Boys’ being runner up. The semi-final was therefore against ‘The Beach Boys’ and ‘Glynis’ Boys’ which ended in a draw. At this stage one member of each team was elected to play a shootout to see who could get nearest to the jack and become winners of this game. This team would proceed through to the final against The Rascals who were already through on the other court. ‘Glynis’ Boys’ won the shootout and met ‘The Rascals’ in the overall Final. The final between ‘Glynis’ Boys’ and ‘The Rascals’ was another tightly fought game, but in the end ‘The Rascals’ came out on top, making this the first year one of the Connswater teams won the shield. Photo: Liz Bowman (Programme Co-ordinator for Jigsaw NI), Arder Carson (Lord Mayor of Belfast), Terry Woodside and Bill Beaumont (service users of Jigsaw NI). 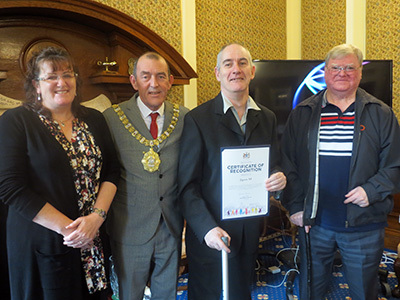 On 9 October 2015, we were invited by the Lord Mayor of Belfast Arder Carson to attend an event at Belfast City Hall to receive a Certificate of Recognition in association with Divis Community Centre. We are so pleased to have been acknowledged for all of our work and dedication to our local community and overwhelmed to be referred to as a ‘true Community Champion’. We develop a range of physical activity programmes for our services users from boccia to swimming. Our activities are for groups of individuals that have a range of disabilities, including mobility problems, brain injury, sensory impairments and multiple sclerosis. It is always great to see our service users enjoying our activities and give them the opportunity to improve their self-esteem, mobility, confidence and health, as well as building friendships along the way! We would like to say a big thank you to everyone that supports us at Jigsaw NI and to the organisers of this certificate!